Wedding services is one of the hottest business in the industry, the necessity of internet usage has been increased with number of traditional activities such as marriages and wedding services, through our Wedding and Matrimonial Service Script you can do lot more. Through our dedicated admin panel you are eligible to customize the script as per your wish, customize CMS pages like wedding venue, catering services, images, recent events modifications, and video galleries etc. Our Wedding Decoration Listing Script revenue model includes banner advertisements, Google AdSense, commission setup etc. Start your revenue model professional business in a wedding services with our user friendly script, we are providing script which is highly superior user interface that will be attracted to every users. 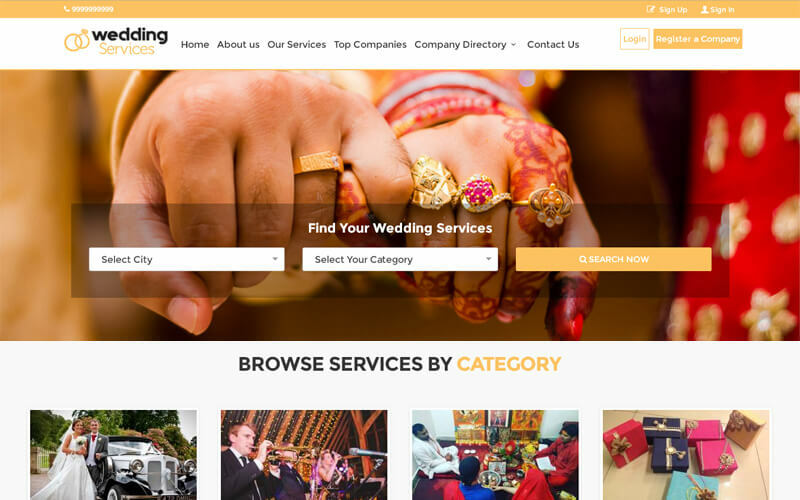 Built a turnkey website with our Php Open Source Readymade Marriage Hall Scriptwhich enables within a minute at an affordable prices.This is highly helpful for the start-up business and we covered all fundamental features for all kind of Wedding Classifieds. Basically a site needs social media integration and social media sharing features, we own them. Our script is SEO-friendly by optimizing it in accordance Google standards making your website list in top of the search results, thereby increasing your website’s ranking and produce more organic SERPfrom the major search engines. Since wedding script is the trillion dollar business through this business you can get as expected revenue from our dedicated unique design, we are introduced the search filter feature that user will able to list out the preferred matches from the number results. Our enhanced features helps to edit the profile and can made modifications like photo uploading and much more, apart from that endless customization made at finger tips without any technical awareness. Fully responsive design which is compatible with all media devices and your script will go crystal clear, with unlimited extend features this made you feel design like honey as sidebar manages all features. With our wedding script you can do better business, still find any queries contact us directly.